Yes, it is important in every interaction with a prospect or customer to actually ask for their business. And this is a big leap in confidence for many, but it is important that you have a clear outcome and next step in mind when meeting a prospect and know how to specifically ask for that outcome and next step. In most instances we know the prospect may not be ready to decide or there may be additional steps required to close the deal. That is why your next actions as a sales person or banker are critical. At the risk of sounding vulgar, there is no A.B.C. without the F.U. Why is Follow Up so critical? Research shows that 44% of salespeople give up after only one Follow Up yet 80% of sales require at least five Follow Ups. And that’s a major reason why salespeople fail to win a deal. Diligent Follow Up and persistence is key. Salespeople must learn how to Follow Up without being pushy or annoying. For these reasons, it just makes sense to develop a diligent Follow Up process. When do I Follow Up? I always recommend that after EVERY meeting with a prospect you should send a Follow Up email summarizing the discussion and/or including your customized proposal within 24 – 48 hours. This will always create a positive impression and many times will set you apart from your competition. Just think about how many times you engaged a sales person or professional services provider and how often they promptly sent a customized email or letter summarizing your discussions and needs. When it did occur, you were always highly impressed. This high benchmark sets the stage for all future Follow Up. The key now is to be diligent and maintain this high standard. There are many ways and forums that you can leverage to diligently Follow Up prospects after the initial meeting and proposal. The key is to ensure that you are demonstrating value each time you Follow Up. Your Follow Up should deliberately demonstrate a continued interest in helping your prospect. In fact there are many ethical closing techniques that you can incorporate in your Follow Up. The key is to ensure that you are always demonstrating value and a willingness to help them gain the great benefits you outlined during the sales process …. or, more effectively, in your proposal. These are lazy and generally focus on what YOU want rather than helping the prospect. A few too many of those emails/calls and you DO start to sound desperate or pushy. Make a call or send an email reminding your prospect about the great benefits / solutions outlined in your proposal and your commitment to helping them promptly realize those benefits or solving their issues. Share market information and articles that your prospect may be specifically interested in and that may help resolve some of the problems they highlighted during your sales meeting. Invite your prospect to an event (either internal or external). Offer your prospect another “no-obligation” meeting with an expert colleague from your Bank or Company to provide more valuable advice. Include your prospect in a Distribution List that includes existing customers to highlight the value they can gain as a customer from regular communications. Personalize one of your Newsletters (regular communications) and/or invite them to subscribe to your distribution list. This is a common question (or concern) I regularly get asked. I always say Follow Up until the prospect says “No” …. but even then you can usually seek their permission to remain in contact (via a regular Newsletter or a scheduled call/visit/event in say 6 months). 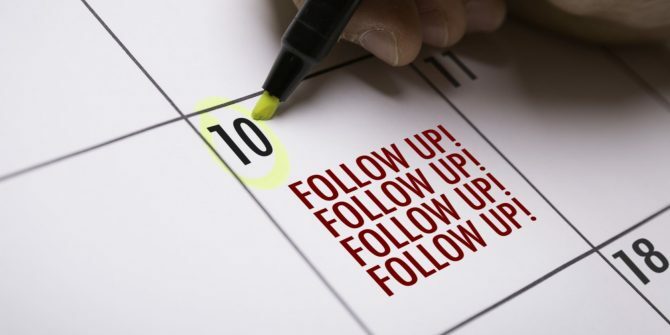 The frequency of Follow Up and the concern that you may be “bothering your prospect” is only an issue if you are not diligently managing your sales process and not adding value every time. As a suggestion, aim to follow up more regularly when you first meet the prospect – say 1 – 2 times per month for the first 2 – 3 months. Then monthly (or bi-monthly) thereafter. When done right, prospects in fact appreciate the follow up and in many instances I have actually been thanked by my prospect for my persistence and genuine interest. Joe I have received more contact and advice from you than I have from my current Banker. Every time I received that positive feedback from a prospect, I closed the deal. Now isn’t THAT a great reason to diligently and more effectively Follow Up your prospects on a regular basis. Rethink your Follow Up process and strategy today. Pull out your Pipeline report and review when you contacted these prospects last. Start following up – make calls and send emails. Remember to Always Be Closing with a great Follow Up strategy. If you found the content valuable then please feel free to share this article with your broader network. Let’s help more sales people become far more effective at Follow Up and close more business.